This peppermint soap has a soft peppermint scent which doesn’t last past the shower. The soap does however, gives a creamy lather. The soap left my skin feeling soft and doesn’t dry out my skin. This is one of my favorite soaps from Burt’s Bees but I am sadden that they discontinued this soap. I think some of the older kits and grab bags they had late last year included some bars. As mentioned I don’t really identify myself with any specific culture or identity. But reading diverse magazines it gives you a different point of view on different topics. Pick up the issue for current events, fashion and lifestyle tips. I love the new redesigned look of the magazine. The bigger font, cleaner and simple layout. Here is cool tip to make your flower last longer -- add a teaspoon of sugar to the water. A tip to keep your files organized come tax time - Have a folder with each of these labels - Bank and Brokerage Statement, Income, Expenses, and Charitable Donations. April 28 is National Superhero Day! Grab a cape and the action figures and go to town! Pick up an issue for health, money and makeup tips. Along with good shopping buys and interviews with Katie Holmes and Kathy Griffin. 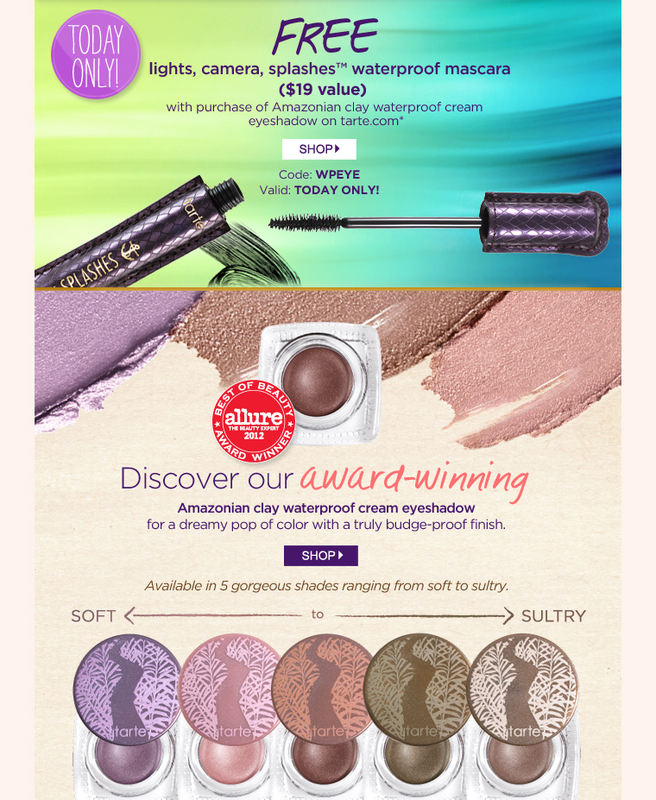 Tarte is offering a fee full size Lights, Camera, Splashes - waterproof mascara when you purchase a waterproof cream and use code "WPEYE"
Stila has a Friends and Family sale with a 20% off coupon. Use "Friends13" to take advantage of this sale. Aveda is offering a 5pc free sample set with a $25 purchase. Enter code "Smoothing63" or "repair63". Estee Lauder is offering a free gift set with a $45 purchase. 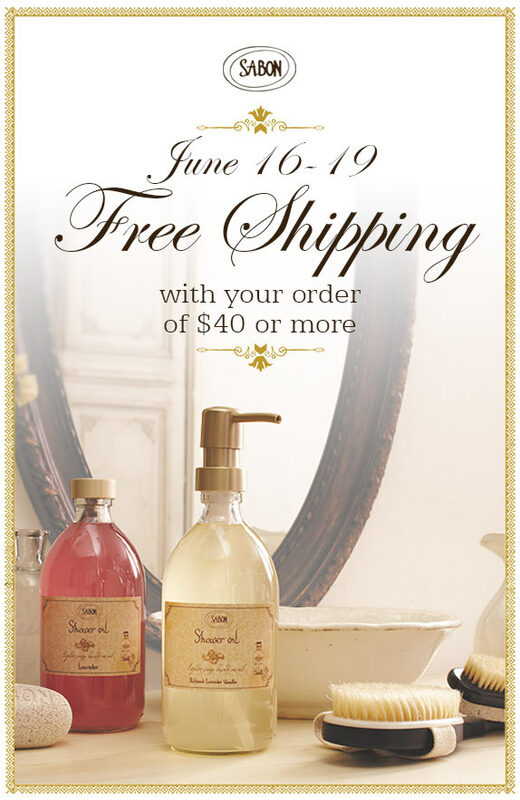 Sabon is offering free shipping when you purchase $40 or more. Completely random, but a free sample packet of seeds from Burt's Bees. LaLicious is having 25% off all coconut cream products when you use "CC25". Today at Thymes is the final day to get an extra treat with your order of $75. Enter promo code SURPRISE13 at checkout, and we'll add a surprise gift to your order (a $36 value) while supplies last. Plus you'll automatically receive free ground shipping when you spend $75 or more. Bumble and Bumble is offering free second day shipping and a travel size surf spray when you enter "JustBeachy"
Crabtree and Evelyn is having an exclusive Friends and Family sale event. This creamy lip tint goes on smoothly. I love the soft berry color with a bit of shimmer is perfect for everyday wear or with a bit of gloss on top for the night. When the soft wash of color wore off, it left behind a shimmery tint. The lip tint made my lips soft and I love that there is peppermint added to the tint. It is a nice treat for soft lips with nice wash color and fresh breath. I really love these lip tints that I went out to buy 7 more. I can’t wait to try them. My only qualm is I always end up getting some of the color on my teeth without fail. So I try to limit my smiling and do my “mysterious face” instead. Although, it is a bit pricey for what it is, so if you can find it on sale -- get it! This mascara does it all! It lengthens, curls, adds volume and conditions my eyelashes. I love how nice my lashes look after applying this mascara. Even though the mascara didn’t clump my eyelashes, I did notice sometimes my lashes stuck together and look like the spider leg trend. Overall, I like this mascara and will still continue using it. Our resort had its own private lake. There is a patio down there on the lake, but I thought alligators [or SUPER CROC!!!] or snakes would get me. The pool during the night but it was also raining so I couldn't go out properly on the patio. There was two jacuzzi and really big pool. I honestly ate so bad and let myself go so much I didn't set foot anywhere that guilt ridden place. Yes, they did have a sauna and a fitness opened 24/7, but I am on vacation. Yes, I am a quite difficult of a person. A beach near the gulf of Mexico. The sand was alabaster white and the clear. The sand reminded me of cement. Although, nothing would be as beautiful as the beaches at Bermuda. Oh, how my heart swells for thee. A hermit crab! There were so many of these. I tried really hard not to accidentally step on the beach. Although, when we were driving passed SeaWorld, there was a turtle in the middle of the road. I think he was trying to run away. I was sitting on these rocks until the tide came and the jelly fishes. I also managed to catch a baby crab in the algae there. I managed to untangled it, I wonder if he remembers me. The ostrich was eyeballing me the entire time. So I paparazzi the heck out of him. 1. Levi is collaborating with Liberty of London. The collection stores in May 5. 2. Derek Lam is vibe to Kohl with influences of Rio de Janeiro. 3. Aldo and Preen are in partnership to bring heels from the runway to the stores. 4. Diane von Furstenberg and Roxy team up to bring new collection of swimwear and accessories. Mix and comb through damp hair. Clip up hair and cover with a shower cap. Shampoo after 15 minutes. “1. Pop Art Lips - a Swipe of tangerine or fuchsia is awesome. Paint lips pink, then tap orange lipstick onto their center to this two-tone look. 4. Celestial Skin - a streak highlighting on the ridge of cheekbones offers a higher bone structure when paired with a contrasting matte foundation. Pearly white pigments took best on fair complexion; peachy bronze works on everyone else. 6. The Smokey Brow - pick a pencil that’s at least a shade darker than your natural brows, and after brushing them upward, make small, feathery strokes to fill in the shapes. Sweep a brown shadow over them a soft, shadowy finish and then set with a brow gel. Pick up the issue for more fashion and makeup tips, an interview with Sheryl Sandberg and her career tips.